A s an aftermath of my adventure with systemic histoplasmosis, I was left with a heightened sense of smell. This presents a problem when faced with cleaning compounds, air fresheners, perfume, and hair spray. 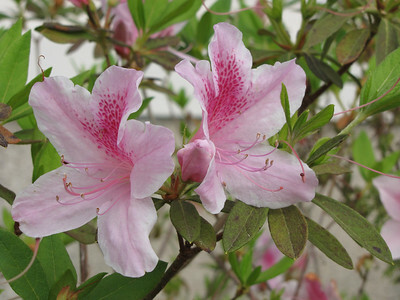 However, it also means I can detect the sweet odor of the azaleas in their last bloom, the wisteria hanging from the tops of the trees, and the orchids in full bloom in my dining room. Our lawn is strewn with pink and white azalea blossoms cast off by some of the high winds we have had, resembling confetti from cascarones. This afternoon we will gather with two sons and their families for an Easter Egg hunt for two little boys and twice baked potatoes by request for the youngest son. I know he is my son as we both share a love of bread–home-made being the best kind. His in-laws have the rest of the meal planned. It is a joyous time. Pawprints: Toby has been feeling much neglected. With a PIC line in place, we thought it too risky to have her around me. She was sure she had done something wrong. On Friday, the PIC line was pulled and she was invited in to watch evening movies with us and to share our morning coffee. She promptly rewarded me with a washing of my arm and the deposit of one of her rawhide bones in my lap. Usually she hides them next to her beer bottles behind the cushion on the couch. She picks those bottles up and makes sure they are quite empty before putting them away neatly. I had a quick question which I’d like to ask if you do not mind. I was curious to know how you center yourself and clear your mind prior to writing. I have had difficulty clearing my thoughts in getting my thoughts out there. I truly do take pleasure in writing however it just seems like the first 10 to 15 minutes are lost just trying to figure out how to begin. Any ideas or hints? Kudos!